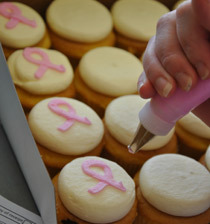 The Cakery has one goal, to satisy our customers and their taste buds. To this end, our bakery provides a superior product, both in taste and appearance. Most who try our custom cakes say, "They are the best ever!" We believe this to be true, but continue to explore new items that you will enjoy and take personally the challenge to keep our quality at a top rating. In addition to our cakes and cupcakes we have a variety of delicious cookies, pastries, peanut butter fudge, brownies and other seasonal delights. 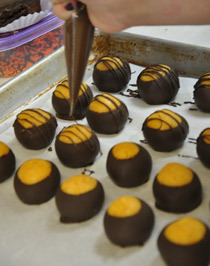 For the die-hard Ohio State fans we have decadent homemade Buckeyes. Your family will not miss out on your special occasion cake with a required 48-72 hours notice. During graduation months, orders are placed weeks in advance, so please don't wait until the last minute. Wedding dates are often reserved more than six months in advance (with the required non-refundable deposit), so please call to arrange your consultation/tasting appointment. We know your wedding cake will be one you and your guests will talk about for a long time to come—and they will be saying "This is the best wedding cake I've ever had!" To our current customers, thank you for your patronage as we know there are other Dayton area bakeries you could frequent. To those who haven't experienced The Cakery, we look forward to meeting you soon! If you have questions about our products and services, call our Dayton location at (937) 258-2320 or click here to email us.